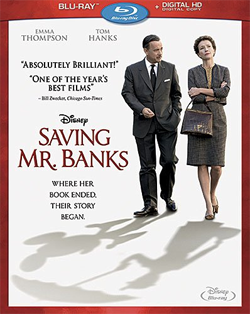 (Release Date: March 18, 2014)  A writer's sometimes painful childhood experiences inform her fiction and the ultimate creation of a timeless cinema classic in "Saving Mr. Banks," a behind-the-scenes biopic of "Mary Poppins" author P.L. Travers (Emma Thompson) and her often demanding collaboration with Walt Disney (Tom Hanks) on his studio's Julie Andrews-starring 1964 picture. Directed by John Lee Hancock, improving greatly upon his hackneyed, homogenized previous effort, 2009's "The Blind Side," the film has been advertised as a light, whimsical family feature for the holiday season. Although distributed by Disney and audiences of many ages will be able to appreciate it, smaller, more impressionable kids and their uninformed parents are sure to be thrown for a loop when they witness its grimmer aspects, from an unsentimental portrait of alcoholism to an attempted suicide. Credit screenwriters Kelly Marcel and Sue Smith for not softening Travers' life and travails, but it would be more honorable for the studio to not be so deceptive about their Christmas release's adult tone and gravitas. Emma Thompson makes buttoned-up and stodgy somehow fiercely lovable in "Saving Mr. Banks." Her P.L. Travers is not the warmest of individuals, stubborn and ready to put anyone she disagrees with promptly in their place. Underneath the tough exterior, though, is an inquisitive soul who still has to propensity to open up her mind to childlike wonder and imagination. It is Walt's passion and determination and the Sherman brothers' beautifully melodic songs that push her along, a visit to Disneyland and hearing "Let's Go Fly a Kite" for the first time major catalysts in her personal and professional journey. In order to truly move forward, however, she must make amends with the plaguing memories of growing up in Australia with a banker father, Travers Goff (Colin Farrell), who had trouble keeping jobs because of his drinking; a mother, Margaret (Ruth Wilson), not fully up to the task of being a parent of three, and their stern yet fair Aunt Ellie (Rachel Griffiths) who swept in to help them in a time of need. If Tom Hanks doesn't completely disappear into his role as Walt Disney the way, for example, Anthony Hopkins did in 2012's "Hitchcock," he does ably embody the larger-than-life figure's indomitable, down-to-earth spirit. Exploration of Disney's life outside of work is only hinted athis daughters' adoration for Travers' book is what made him want to turn it into a moviebut that is okay, since this is Travers' story more than his. In flashbacks that strike with reverberating retrospection and nostalgia, Colin Farrell and Ruth Wilson hauntingly portray Pamela's troubled parents, in love with their kids but unable to overcome their own demons. Paul Giamatti is his reliable, wonderful self as Ralph, Travers' dedicated driver while she's in Hollywood, and Melanie Paxson, as Walt's chirpy assistant, Dolly, is a bubbly ball of light with a mischievous, unsuspecting mastery of sharp comic timing. The 125-minute "Saving Mr. Banks" has a lot to say about the relationship between literature and film as separate mediums and the pursuit to retain dignity over one's art, and director John Lee Hancock achieves all of this with a heartfelt but not mawkish tone. Commonplace tropes do rear their ugly headsthe whole blood-in-the-handkerchief bit to depict a character's fatal illness deserves to be retired for goodbut they are minor within the full scope of the film. The ending, detailing Pamela's emotional trip to the star-studded "Mary Poppins" premiere at Grauman's, is deeply moving, an ideal capper that, perhaps wisely, doesn't overtly go into the misgivings she retained about the adaptation in the years following. What is important is that Disney did, finally, understand that the character of Mary Poppins came to not save the children, but their father, and made sure to stay true to this in his movie treatment. "Saving Mr. Banks," likewise, appears to be a respectful glimpse into the complicated but virtuous person Travers was, as a woman and an artist. She may have been hard to please, but she likely would have approved of this warmly felt biopic. Rest assured, a spoonful of sugar is not needed to help this marvelous 1080p digital transfer go down. The golden browns, yellows and oranges of the flashbacks to P.L. 's childhood in Australia intermingle with the bold primary colors of the 1960s scenes set in London and Los Angeles, and all of the above are resplendent. Some sequences seem to have been lensed more softly than others (edges, for example, aren't consistently sharp), but this was likely intentional, better to emulate the feel of generations past. By and large, the imagery is absolutely striking in its detailed resolve. The 5.1 DTS-HD Master Audio is full of natural robust vigor, the orchestrations of composer Thomas Newman coming through the surround speakers with immersive but not overpowering oomph. The V/A quality of this Blu-ray is candy for the eyes and ears. "The Walt Disney Studios: From Poppins to the Present" (14:35, HD); Deleted Scenes (7:24, HD); "Let's Go Fly a Kite" (1:47, HD), a touching featurette capturing "Mary Poppins" songwriter Richard Sherman performing this song live for the cast and crew on the last day of filming. Disney's Blu-ray release of "Saving Mr. Banks" is light on extras, but the film is so winning and the high-definition video and lossless sound are so attractive that most audiences will be delaying their kite-flying in lieu of gathering around their home theater screen. Chim Chim Cher-ee, indeed! Recommended.